Hammock is the perfect playtime accessory for ferrets and other critters that provides a comfortable spot to snuggle and nap after fun and play. The hammock comes with four strong clips so you can position and safely attach your hammock to any wire pet home. 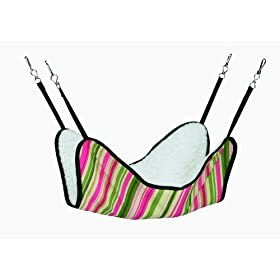 Hammock is made from a brightly colored, soft cotton fabric that is machine washable ensuring your friend will always have a clean place to snooze. Available in a variety of colors.